“Prepping For Life” launches TODAY! 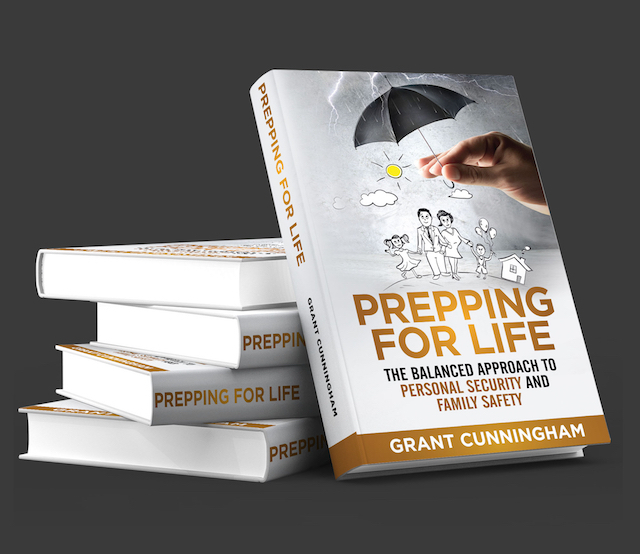 My new book, Prepping for Life: The balanced approach to personal security and family safety, is now available on Amazon and the iBooks Store! If you’ve been following my blog for any length of time, or watched my posts on social media, you probably know that my focus is on total self protection. I focus on personal security in what can only be described as a holistic manner, looking at what safety really is and how to achieve it. Personal security is more than just knowing how to shoot well! The big problem, of course, is that personal security is a huge topic. It’s easy to get lost in the details and end up focusing on a small set of skills or a small piece of preparation to a great degree, while other aspects of safety get ignored. That’s why I wrote Prepping For Life. I wanted to write a book that would help people see the “big picture” and show them a way to make progress in all areas of their personal security and preparedness. What’s more, I wanted to show each reader how to figure out what’s most important for them, in their lives, and prepare based on their needs. Prepping for Life doesn’t tell you what to do, but rather how to decide what’s important for you to do. Life in my little corner of the world is different than yours, and each of us has different needs, resources, energy levels, and time commitments. This book shows you how to to plan for your security and your family’s safety with a decision-making framework that’s both flexible and motivating. Everyone is looking for “life balance”, and that’s important in preparedness too. The unique Prepping for Life structure gives you a framework into which all of your preparedness and self defense activities fit. You can see where you’re well prepared and where you can use more emphasis. It allows you to equip, train, and maintain your preparations with a minimal amount of disruption in your life. Here’s the information page for Prepping for Life, where you can learn more about what I believe to be a breakthrough book in self defense, disaster preparedness, and family safety. Order your copy now and start your journey to well-balanced preparedness! P.S. : Prepping for Life is now available in print form, as well as Kindle and iBooks formats! Hey Buddy!, I found this information for you: "“Prepping For Life” launches TODAY!". Here is the website link: http://www.grantcunningham.com/2017/08/prepping-life-launches-today/. Thank you.